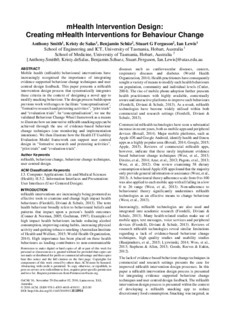 Mobile health (mHealth) behavioural interventions have increasingly recognised the importance of integrating evidence supported behaviour change techniques and user centred design feedback. This paper presents a mHealth intervention design process that systematically integrates these criteria in the context of designing a novel app to modify snacking behaviour. The design process builds upon previous work with stages to facilitate "conceptualisation", "formative research and pretesting activities", "pilot trials" and "evaluation trials". In "conceptualisation", we use the validated Behaviour Change Wheel framework as a means to illustrate how an innovative mHealth snacking app can be achieved through the use of evidence-based behaviour change techniques (cue monitoring and implementation intentions). We then illustrate how the Health IT Usability Evaluation Model framework can support user centred design in "formative research and pretesting activities", "pilot trials" and "evaluation trials".